MuleyCrazy was founded in 1992 by Ryan Hatch in Kanab, Utah. As a die-hard mule deer hunter and very successful guide, he began producing the best-selling MuleyCrazy Video Series, which now includes 10 videos featuring some of the largest bucks ever filmed. 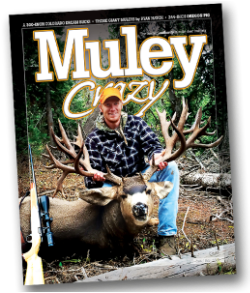 To satisfy the huge public demand to see more giant muleys, Ryan and his wife, Alicia, started MuleyCrazy Magazine in 2002. Since then, distribution has grown immensely, with subscribers all over the United States, as well as Mexico and Canada. As the business has grown, so has the need for more space for our world-class mule deer display, which Ryan has collected over the years, and for our ever-expanding retail sales department. In 2012, we built a new office where we now produce the magazine, showcase one of the best mule deer collections in the world, and stock our inventory of optics and hunting gear. Although the business has grown tremendously since it started, we attribute a large portion of our success to the fact that we’re still a small, family-run operation and we still pay individual attention to our subscribers, customers and fellow hunters. It all started as a big dream and a small publication put together on the Hatch’s kitchen table. Now, MuleyCrazy is the leading authority in mule deer hunting, and your go-to source for the best hunting optics and hunting gear. We thank our subscribers for their years of loyalty to MuleyCrazy; without them, this would not be possible.